What is the Sharksafe Barrier? 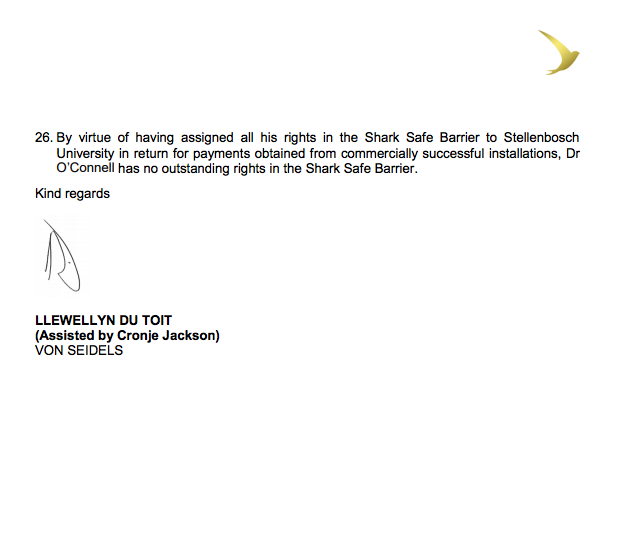 In 2014 I was in South Africa researching the shark mitigation company known as The Kwazu-Natal Sharks Board. While there I met some people who had been working on an alternative to the Shark Board's method, known as the Sharksafe Barrier. I thought the idea was great so decided to make a short video based on their interviews. The flowing barrier mimics a kelp forest, with the inspiration based on the belief that seals take refuge from large sharks within kelp forests. Key advantages are that this "moving curtain" does not trap or drown animals the way existing shark nets do while still providing a deterrent to large sharks who possess large"pectoral wingspans" such as the white shark. ​The barrier footage and interviews were provided via blessings of Shark Diving Unlimited. Michael Rutzen mentions collaboration with Dr. Craig O'Connel, whom I showed the video to in 2014 for his blessing. The shark footage is mine (Skyler Thomas). 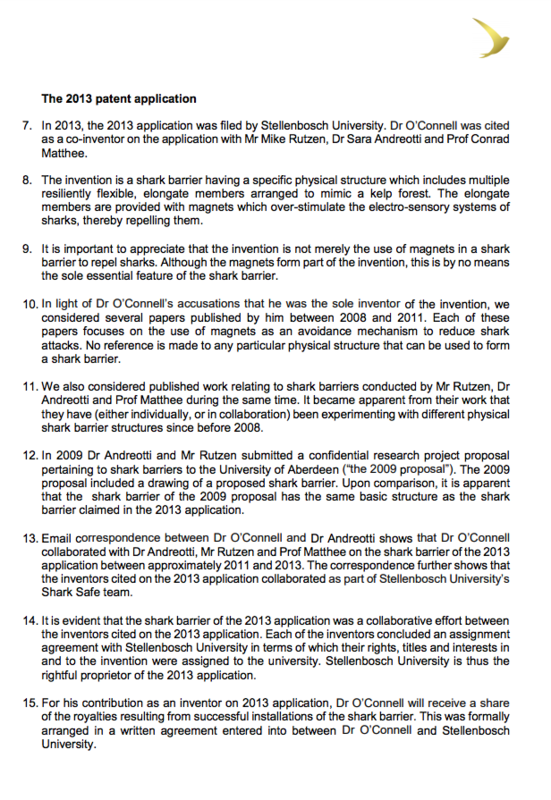 Unfortunately, the Natal Sharks Board told me directly that they have no intention of using this barrier. Also unfortunate, is that this topic now has controversy surrounding it. As happens far too often in shark world, what should be a good story and good news for sharks is shrouded by human behavior. 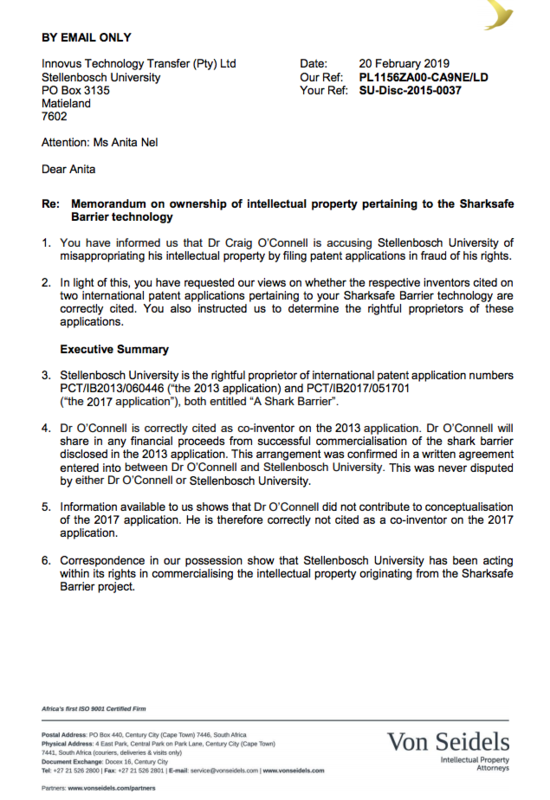 Craig O'Connell has taken to social media to express his displeasure of "his invention" being used without being consulted. Why would Craig approve the video I made, in which Michael Rutzen refers to the idea as his own, then change his tune and essentially attack the collaborators? And why would Craig's collaborators not tell him about Reunion? It seemed I did not have the whole story so I contacted the accused to hear their side. 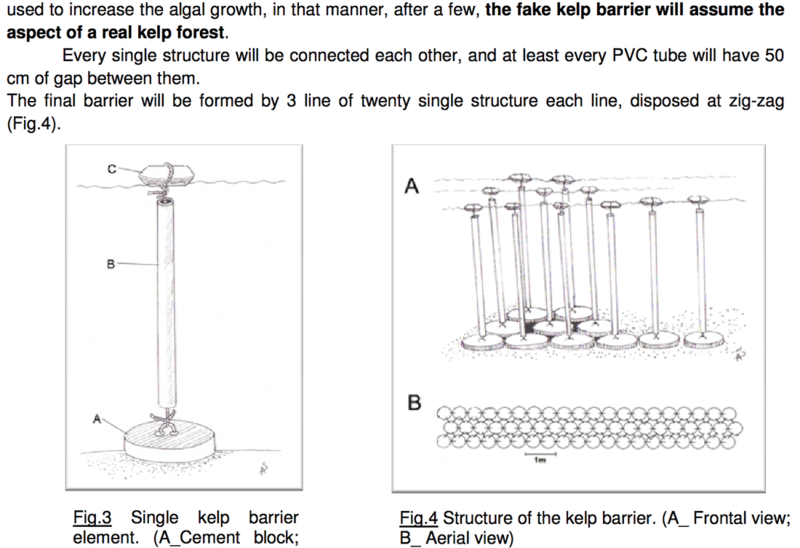 The story, as told to me, is that the kelp forest idea originated in South Africa with the first conceptual drawing of Mike's idea appearing in a funding application in 2009. Just because this is what I was told does not mean it is the truth so more digging was necessary. Being as how white sharks and kelp forests both exist in South Africa, but not Bimini, I can see how the inspiration came from South Africa. Again, as told to me, this design was later combined with Craig's magnet work that had been developed in Bimini. This was a collaboration with the teams working together. I personally first became aware of the barrier in January 2014 when I saw the diagrams of the barrier displayed on the walls at Shark Diving Unlimited in Gansbaai, South Africa, which prompted the interview (these diagrams appear in my video at the top of the page). Upon inquiry I was provided a copy of the proposal mentioned above. Rough sketches of the barrier (as seen on the left) were included in the proposal. This further lends to my initial impression that the original idea was born in South Africa with a collaboration formed later. 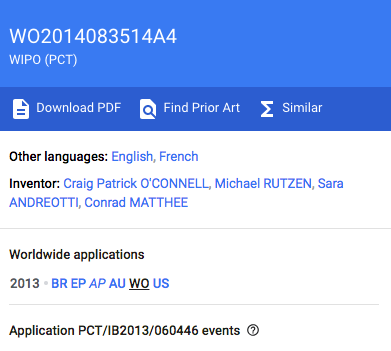 I do have access to a paper by Dr. O'Connell, but it is dated 2014 and the design is different. If anyone has documents predating these I would be pleased to see them. There seems to be foul play here. Either Craig has been wronged by his former collaborators or he is committing the foul play himself with false accusations and proclamations of being the original and principal inventor. Who is telling the truth? Sharks Among Us from Marius W. van Graan on Vimeo. A few people on social media have referred to a "documentary" that proved this was Craig's invention. The segment (which can be watched on the left) certainly makes it sound like it is Craig's invention and Craig isn't shy about saying "me and my" repeatedly on the show nor in his Facebook post. The team at SDU are barely mentioned at all. ​Indeed, according to the show, it seems to be Craig's idea. Since there are four inventors, I personally would have been a bit upset to not even receive a mention in the show. If I had no other source of information than the show the conclusion would certainly be that this was Craig's. However, this "documentary" is just a 'Shark Week' show, programming which is not exactly synonymous with integrity or accuracy. 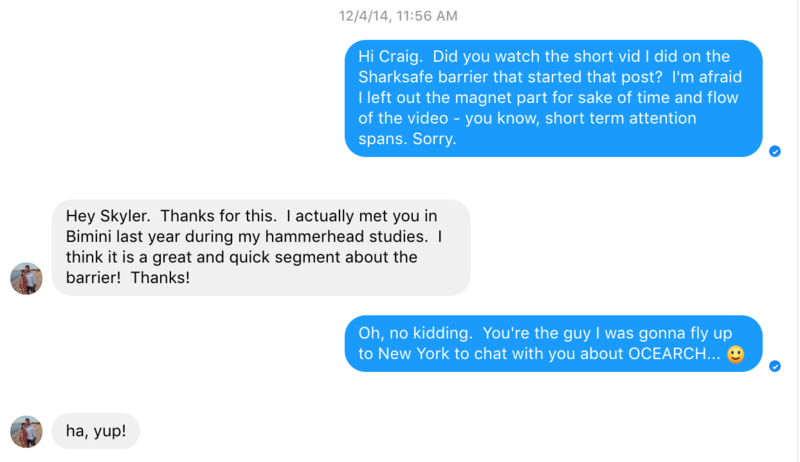 Craig is one of Shark Week's new "go-to" hosts and Shark Week scientists are also not the top of the list for integrity or accuracy. To summarize the above clip, an American gets flown over to South Africa to talk about the invention he's been developing...in the Bahamas. Wait, what? 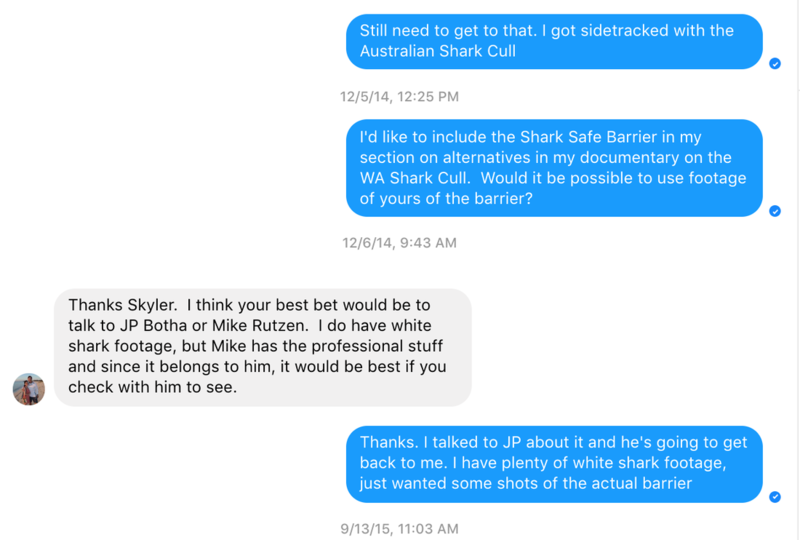 The Natal Sharks Board, featured in the clip above, is shown talking to Craig about the need for an alternative to the existing lethal methods. I wish this were the case, but KZNSB has absolutely no intention of using this barrier. From their own lips, they are 100% dedicated to working on their electrical field deterrent and not any other projects. This was said to me by the head of research and the head of special projects during interviews I conducted last summer. Making matters worse, in the same interview they essentially admitted that their own idea wouldn't ever work, which means current culling will continue as usual for the foreseeable future while the public waits for an alternative that will never arrive. Back to the current drama. 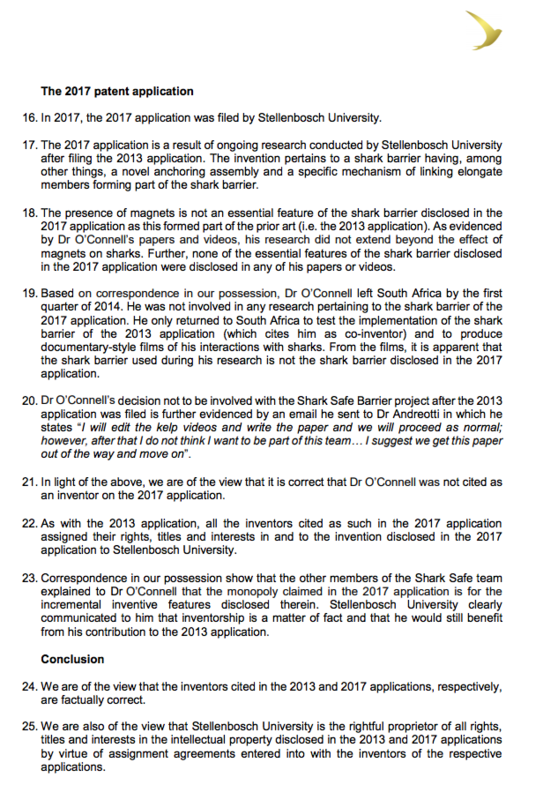 I received more clarification on the barrier's status via communication with the directors at SharkSafe Barrier PTY LTD, "The IP was sold by the 4 inventors to the University of Stellenbosch in exchange of royalties, financial and legal support, back in 2012." That would mean, as I understand it, that the barrier and what is done with the barrier is now in the hands of Stellenbosch University. It is good news that Reunion Island is willing to try it while the inventors collect royalties. Seems like a win win...except for the guy screaming "Look at me, look at me!" so loud that the conservation story is drowned out. 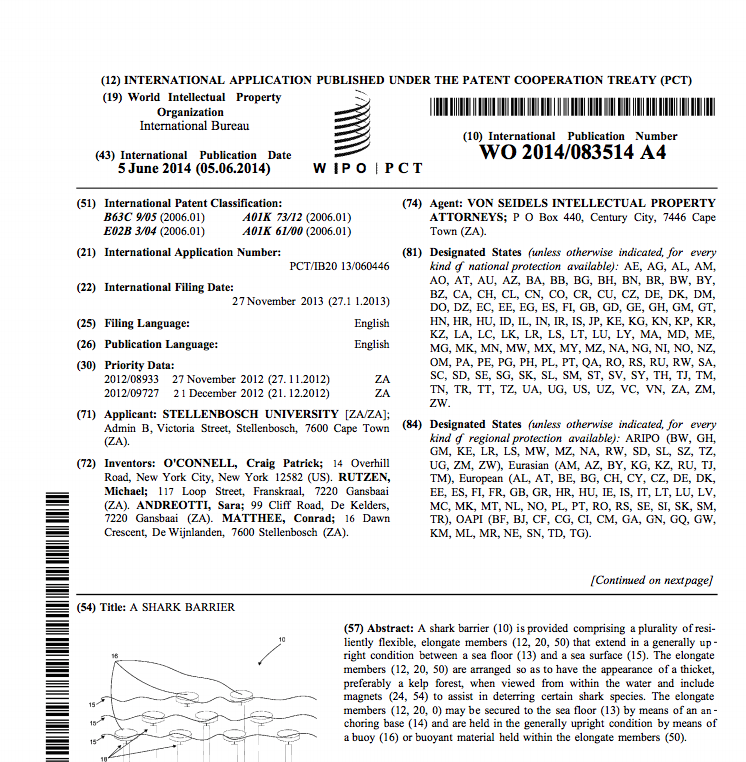 Here is a link to the patent, which features the names of four inventors, Craig included. For the record, while I am happy for improvements to existing lethal shark mitigation, I believe the only real solution lies with humans accepting that we are not alone on this planet and that some of other inhabitants are predators. Attempting to use a dynamic ecosystem in which predators dwell as a place of recreation has consequences and should have consequences.